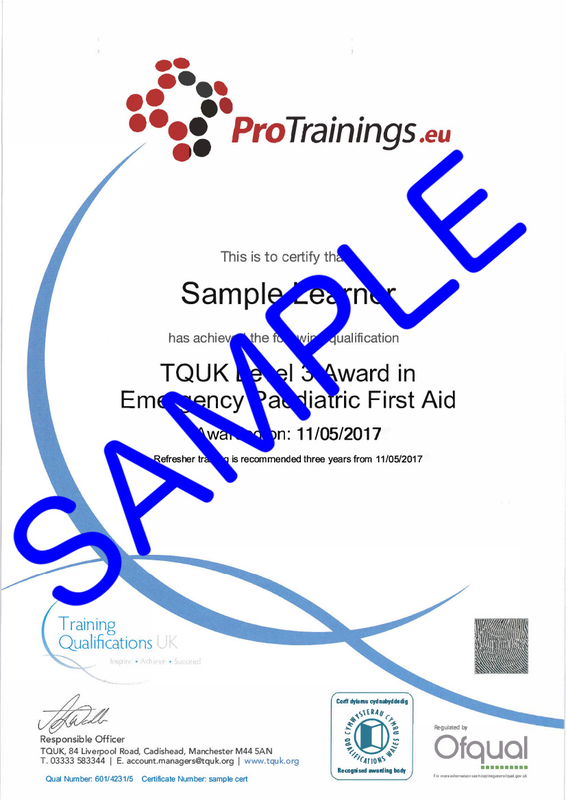 TQUK Level 3 Award in Emergency Paediatric First Aid (RQF) Blended Part 2 for those who have completed the online part. This course is the entry level Paediatric First Aid course and forms the unit 1 of the full Paediatric first aid course. In many situations, if you are registering with Ofsted you will need our full two days or one day online followed by one day in the classroom first aid course. On completing this course you can then complete the unit 2 course and receive the full Paediatric First Aid Award at ProTrainings. All our first aid courses fully meet the UK and European Resuscitation Council Guidelines 2015 as per the HSE requirements and are the latest 2019 version as laid down by the Awarding Organisations.